Child to a popular artist couple, his mom Singer (NALVA AGUIAR) and his father singer DENY (DENY & DINO), at the age of 5 danny got interested in music. As a boy used to watch carefully while his mom (Nalva) and uncle (Fausto) listened to songs in an old fashioned “Telefunken” electrolyze, which belonged to his grandpa Danny has preserved to these days in his home. At the age of 9 the young boy started his studies of popular acoustic nylon guitar, which he used to practice with his cousin during the Summer holidays. 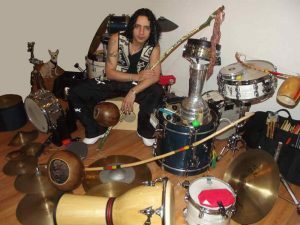 At 13, after watching repeatedly his mother’s band rehearsals, Danny noticed an intriguing feeling which was taking over and realized it could only be the drums the instrument responsible for the orgastic emotion he through music. From that point onward, Danny would spend all his free time in the studio, where he would make his first attempt at the drums during rehearsals breaks. That having started, the boy came to realize he picked up that instrument with incredible ease, which finally drove him to drop his acoustic nylon guitar lessons and embrace his real calling at the drums. After a few months practicing, without really realizing it Danny had all of his mom’s repertoire in hands and in case some of the drummers was late or didn’t show up he would fill in with competence and rehearse with the hand. Danny joined his mother’s team on tours for some time as a “illuminator” and finally, at 15, started working professionally as a drum player. Danny started studying for his music qualification degree at Music Conservatory Cora Pavan Caparelli in Uberlândia but wasn’t able to conclude it due to back of time available, once he was already travelling steadily around the country on tour with the band. Between June 88 and June 89 lived in New York – NY e Columbus-OH, where he attended a DRUM CLINIC given by Chad Rager. In 1994 too part in the XVI International Summer course at Brasília School of Music given by Pascoal Meirelles. In 1995 Danny attended Billy Cobham’s workshop in Brasília. In 1996 Danny began to see one of his all time dreams come true! Having his own recording studio, which was to be Danny’s own “STUDIO QUEOPS MUSIC”. In June 1996 Danny joins in with the most popular progressive rock band in Brazil, O TERÇO recognized by the Asociacion Del ROCK Progresivo e Seventh Heaven Discover. In 1999 attended Dave Weckl’s workshop for the IV Batuka in São Paulo – SP. In 2000 Danny attended Lincoln Cheib’s workshop in Uberlândia – MG. In 2001 Danny joined in with ALEXANDRE PIRES’s band, having participated from the start of the band’s path national and international tour’s. During the excursion Danny was one of the few Brazilian musician to play in Madison Square Garden at a Latin music concert. Since 1996 Danny has Capet his studio at full power producing arranging and playing for and with independent artist of Uberlândia – MG (Brazil) and so rounding. Danny has lived in the US and in COLUMBUS – Ohio since 2004, recording and playing with the best musicians in town.